Background: Work-related musculoskeletal disorders (WMSDs) are responsible for morbidity in many working populations, which are of multifactorial in origin and of global concern due to industrialization. Dentists as one of the health-care professionals are prone to develop these WMSDs. The study aims to determine the prevalence of WMSDs among dentists in Bhopal region and explores the various risk factors for the development of MSDs and WMSDs. Materials and Methods: This proposed study is a cross-sectional study conducted among dentists of two randomly selected dental colleges of Bhopal, India. A structured questionnaire was used to collect the demographic information, occupational history, risk factors, and ergonomic awareness with job task details. Prevalidated standardized tools such as quick exposure check list, rapid entire body assessment score sheet, and Nordic Musculoskeletal Questionnaire were also used. Data were entered in MS-Excel and analyzed through SPSS version 18. Results: More than 92% of the participants reported pain and discomfort in at least one part of their body. The major affected body part is neck, followed by the lower back and wrist. More than half of the orthodontists and oral surgeons reported that their MSDs are work-related origin. Pearson's correlation test indicated that there is a positive correlation between the current exposure and risk (r = 0.613). Multivariate regression analysis found that younger participants, male (OR = 4.1), involved physical activity (OR = 1.04), dentists not taught about ergonomics in their dental school (OR = 1.69) or never attended any workshops (OR = 1.38), who reported task involving sustained muscle contraction (OR = 1.12) or task with repetitive movements (OR = 1.11) are the major risk factors for the development of MSDs among the dentists. Conclusion: This risk assessment study found that there is a high prevalence of MSDs and WMSDs among dentists. Ergonomic awareness and health promotion need to be integrated with the professional practice for dentists. Work-related musculoskeletal disorders (WMSD) related with repetitive and demanding working conditions continue to represent one of the biggest problems in industrialized countries. The World Health Organization (WHO), recognizing the impact of work-related musculoskeletal diseases, has characterized WMSDs as multifactorial, indicating that a number of risk factors contribute to and exacerbate these maladies. The presence of these risk factors produced an increase in the occurrence of these injuries, thus making WMSDs an international health concern. These types of injuries of the soft tissues are referred to by many names, including WMSDs, repetitive strain injuries, repetitive motion injuries, and cumulative trauma disorders. Besides the physical demanding of the jobs, the aging of the workforce is also a contribution to the widespread of WMSD, since the propensity for developing a WMSD is related more to the difference between the demands of work and the worker's physical work capacity that decreases with age. WMSDs have also heavy economic costs to companies and to health-care systems. The costs are due to loss of productivity, training of new workers, and compensation cost. The strong correlation between the incidence of WMSD and the working conditions is well known, particularly the physical risk factors associated with jobs, for example, awkward postures, high repetition, excessive force, static work, cold, or vibration. Other psychosocial factors such as work intensification and stress are also seem to be factors that increasingly contribute to the onset of those disorders.,,, Psychosocial factors (increase of workload, time pressure, little autonomy over work, monotonous work, and the lack of support from colleagues and chiefs) and their interaction with biomechanical factors, high repetitiveness, vibrations, static muscular constraints, and poor postures have also been considered in different studies., As referred, the WHO attributes a multifactorial etiology to WMSD, which means that these disorders appear as a consequence of the worker exposure to a number of work-related risk factors. Health-care work is known as a high-risk job for WMSDs. As dentists are more exposed to abnormal postures as the part of their occupation, this profession necessitates a high degree of meticulous performance, keen sight, focus, alertness, manual proficiency, psychomotor skills, and they have to maintain prolong static postures, repeated neck, arms, and hand movements; the most common position of dentists is sitting position, treating the patient in the supine position and extractions which involves standing or sitting at various angles. If regularly occurring discomfort and stress in these positions are ignored, it is likely to cause long-term musculoskeletal as well as psychological damage leading to deterioration of productivity, performance, and finally career-ending detriment.,,,,, The study aims to determine the prevalence of WMSDs among dentists in a specific study area and to determine the contribution of current exposure to risk of relevant individual, work, and ergonomic factors and development of WMSDs. This cross-sectional study was conducted among dentists of Bhopal, Madhya Pradesh. Dentists from two different dental colleges and hospitals were recruited through stratified sampling. Selection of the dental collages was purposive by the principal investigator. The study proposal was approved by the Institutional Ethics Committee (Reference: TRC/IEC/1/2015) of Sri Indian Institute of Public Health, Gandhinagar, India, prior to the data collection. The study participants were informed about the study, its objective, and benefits. Dentists who were working in sampled dental colleges, in clinical practice, and willing to participate in the study after giving their consent were included in the study. Dentists who had experienced any road traffic accident/fall injury or who are not in clinical practice or who refuse to give consent were excluded from the study. Through a systematic stratified sampling process, dentists from eight departments involved in clinical practice were proportionately selected. Stratification was done on the basis of the specialty and various branches in dentistry. Structured survey questionnaire was given to the sampled dentists (N = 93), which had five sections. The initial two sections, i.e., sociodemographic details and workstation information were collected by interviewing of dentists, and validation of these sections was done during the initial phase of data collection. The remaining sections contain prevalidated standardized tools such as quick exposure check (QEC) list. 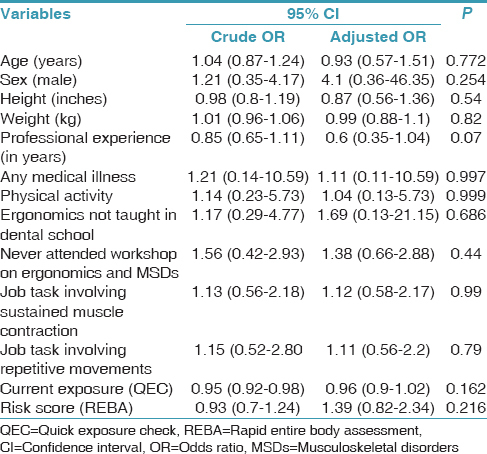 Rapid entire body assessment (REBA) risk scoring list and Nordic Musculoskeletal Questionnaire , were filled by the investigator with observations of 10–15 min and necessary parts were asked to participants. After data collection, the data entry was done in MS-Excel. Descriptive analysis in the form of mean with standard deviation or percentage was conducted for demographic variables and occupational information. Test of significance such as independent “t-test” and Chi-square test were used for comparison and are shown with P value, considering the level of significance at P < 0.05. Pearson's correlation test was applied to understand the current exposure and risk correlation. A multivariate regression analysis was done to understand the risk factors for MSDs. Data analysis was performed using R software (3.0.1 version, University of Auckland, New Zealand). The mean age, height and weight of all respondents were 27.73 ± 3.15 years, 65.36 ± 3.06 inches and 61.75 ± 11.36 kg respectively. The total years of professional experience were 5.54 ± 2.97 years, years of involvement in this job task were 5.82 ± 2.99 years, and the total working hours per week were 54.35 ± 8.32 h, as shown in [Table 1]. The study population comprised 62.9% females and 37.1% males. A composition of 74.1% of the dentists were into clinical practice whereas 25.9% were both clinicians and academicians. Among all the dentists, 22.2% were married and 77.8% were unmarried. 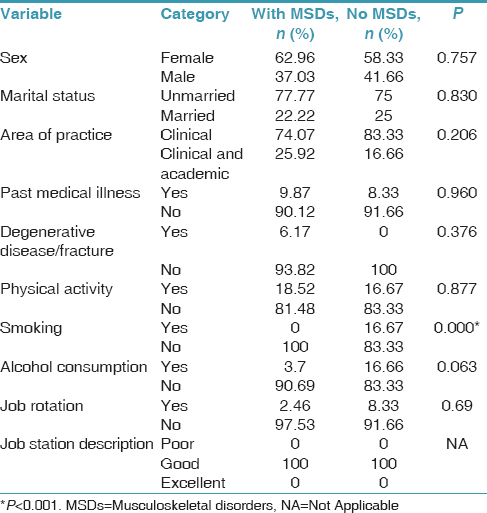 None of them were having smoking habits, whereas only 3.7% were occasional alcohol drinker and of all, 18.5% were involved in some or the other types of physical activity such as sports, exercises, and yoga. In the study sample, all the dentists (97.5%) work in their specific job station constantly without any job rotation, as shown in [Table 2]. The perception about job station of all the dentists was found to be good. Chi-square test shows no statistical significant difference between the group with MSDs and group without MSDs in relation to the above-mentioned sociodemographic factors. As shown in [Table 3], the major ergonomic risk factors perceived by the dentists were continuous inspection, use of finger pinch grip, and frequent bending of elbow/shoulder joints in their daily practices. Another risk factor as reported by the participant is that they have to be in a constrained posture for longer duration to perform the activities. About 95.7% of the dentists reported that they were aware of treatment options for MSDs, whereas about 77.4% were aware of preventive techniques of MSDs. Among the participants, only 33.3% had a previous knowledge on ergonomics and 38.7% attended any workshop on the prevention of MSDs. About 92.4% of the participants reported pain and discomfort in at least one part of their bodies in the past 12 months and 87.1% of the participants complained of musculoskeletal pain in the past 7 days. Among all the reported MSDs' symptoms, neck pain was the highest, i.e. 88.17% followed by the lower back pain (86.02) and wrist pain (54.8%). MSDs of different body region pain reported for the past 12 months and for the past 7 days have been shown in [Figure 1]. There were various coping strategies adapted by the study participants to counteract with their musculoskeletal pain among the MSDs reported in dentists. About 74.1% of the participants took rest as prime coping strategy, 49.38% used to opt for medication, and other 33.33% follow different coping strategies which include acupressure, physiotherapy, stretching exercises, local application of ointment, and adopting correct posture. MSDs are work-related or not have been explored, which is uniqueness of this study. Three screening questions have been asked to decide whether MSDs are work-related or not, i.e. whether the symptoms increase during working hours, whether the symptoms decrease at the end of the shift, and whether the symptoms decrease during holidays. Those dentists having MSDs satisfied the above three conditions were categorized as WMSDs, i.e., MSDs of work-related origin. 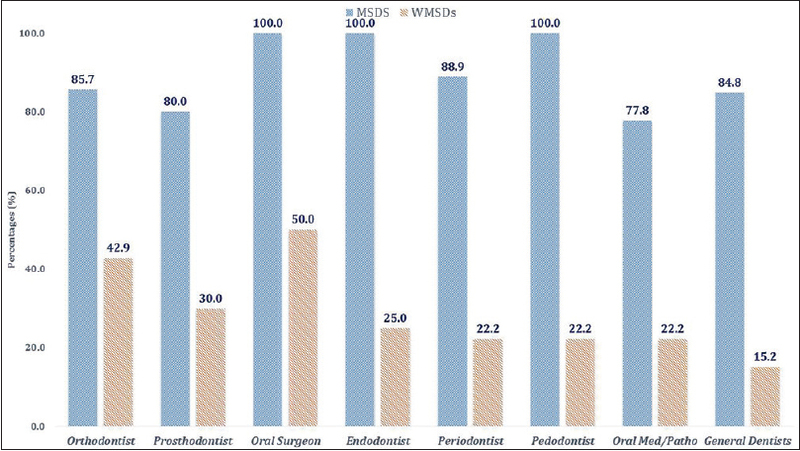 MSDs-WMSDs distributions across the various sub-branches of dentists have been shown in [Figure 2]. More than half of the orthodontists and oral surgeons were reported that their MSDs are work-related origin as compared to other dental professionals. The exposure assessment (QEC) shows that most of the participants (93.8%) have medium to high exposure. Few dentists have very high exposure for the same. Whereas risk assessment (REBA) shows that 44.1% of the participants were having very high risk, require implementing change followed by 39.78% of participants who fall under high-risk group and 16.13% under medium risk group that necessitates further investigation and needs to implement change. The details of current exposure and risk levels among participants are shown in [Figure 3]. The correlation coefficients for final scores of QEC exposure levels and REBA risk levels were 0.61. 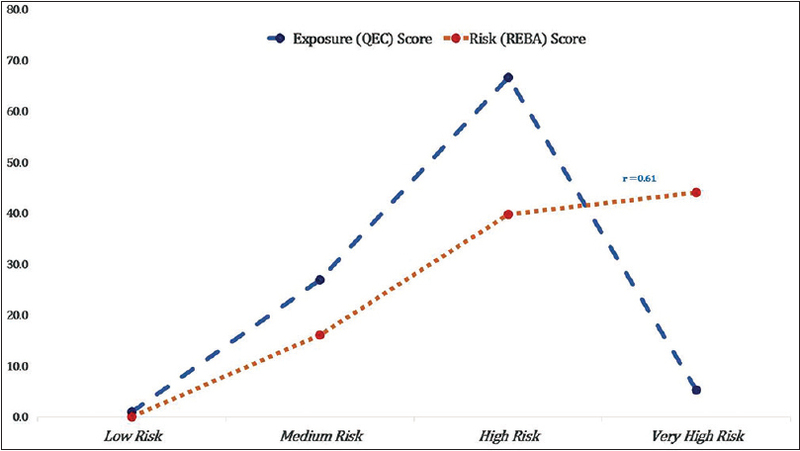 The association between exposure and risk was found to be significant as P < 0.05 (r = 0.61). The regression model on the risk factors of MSDs after adjusting to the exposure variables was shown in [Table 4]. It has been found that younger participants, male (OR = 4.1), doing physical activity (OR = 1.04), dentists not taught about ergonomics in their dental school (OR = 1.69) or never attended any workshops on ergonomics and risk of MSDs (OR = 1.38), dentist reported as the task involving sustained muscle contraction (OR = 1.12) or task with repetitive movements (OR = 1.11), and having higher risk score (OR = 1.39) were identified as the major risk factors for MSDs among dentists in this study. Prevalence of MSDs among Indian dentists from various research studies has found to be higher. The current study result shows that 92.4% of the dentists reported pain and discomfort in at least one part of their bodies in the past 12 months and 87.1% of the dentists reported joint pain in the past 7 days. A study by Gupta et al. 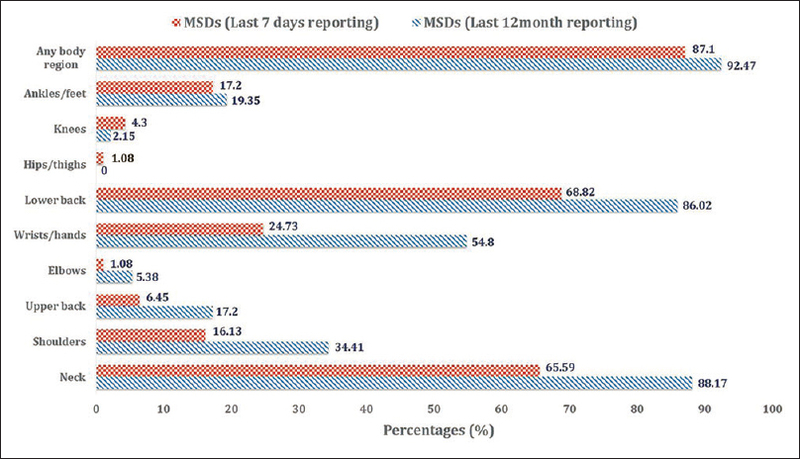 shows that 79% (n = 2166) of the western Indian Dentists were suffered from MSDs; while 90% of the dentists with MSD took the medication. Another study by Saxena et al. from Madhya Pradesh found that 83.1% (n = 213) had at least one musculoskeletal pain in the past 12 months. The most frequent was low back pain (57.75%) followed by neck pain (31.17%) and wrist pain (17.84%). Astudy in North India shows that 70% (n = 2015) of the dentists suffered from MSDs. Among all reported MSDs, neck pain was the highest followed by the lower back pain and wrist pain, over the past 12 months. In line with the above prevalence, exposure and risk scores sound to be high among these participants with a positive (r = 0.613) correlation. In addition, the findings regarding the most affected body regions and risks of MSDs by Yasobant and Rajkumar , are consistent with our results. All these figures call for corrective actions to overcome these self-reported musculoskeletal pains, which are prevalent among dentists. Risk factors for MSDs among dentists also have been explored well, and various researches indicate that WMSDs are multifactorial, caused due to the interactions between various risk factors, which result in conditions that vary across different job tasks., A research by Rehman et al.,, reported that the symptoms are a product of many risk factors including prolonged static postures, repetitive movements, and poor positioning.,, On the other hand, Ratzen ,,, linked musculoskeletal pain occurrence in the dentists to the frequent assumption of static postures, which usually requires more than 50% of the body's muscles to contract to hold the body motion less, while resisting gravity. The static forces resulting from these postures have been shown to be much more tasking than dynamic forces. Repeated prolonged static postures are thought to initiate a series of events that could account for pain, injuries, or career-ending problems seen in MSDs. The current study identified that task involving sustained muscle contraction (OR = 1.12) or task with repetitive movements (OR = 1.11) and having higher risk score (OR = 1.39) were the major risk factors for the development of MSDs. An interesting fact is that this study explored that those dentists who were unaware of ergonomics either through taught in school (OR = 1.69) or through any workshops (OR = 1.38) are at more risk of developing MSDs in their professional life. Prevalence of MSDs among dentists in this study was found to be very high as 92.7% for the past 12 months and 84.7% for the past 7 days, as reported. 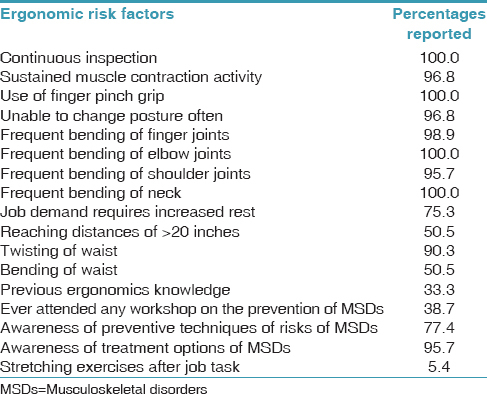 The major risk factors for MSDs among dentists identified in this study are unawareness about ergonomics and ideal posture for safer job task and task which involves sustained muscle contraction or repetitive movements. The exposure in their current job station and risk of MSDs were found to be high, indicating an urgent need of in-depth ergonomic evaluation of their workstation and screening for MSDs need to be rolled out. The nonprobability sampling method employed in this study prevents the generalization of results. Since the questionnaires on ergonomic hazards used in this study are self-reported, there are chances for subjective bias. In addition, the work postures were observed only once for a brief period of about 15 min for each subject, which might give an incorrect risk status. A better planned long-term study eliminating limitations of the current study and using a mixed method approach will give a more accurate estimate of WMSDs and exposure-to-risk levels among dentists, and thereby a better means to accurately recommend and implement policies and strategies to combat this serious issue of WMSDs among dentists. We recommend that education, awareness, and training programs on prevention and coping strategies for MSDs have to be made mandatory for dentists, preferably prior to the initiation of clinical practice. A continuous evaluation and screening strategy for MSDs need to be developed as an urgent call. We are thankful to the participants of the study who gave us an unconditional support. We are thankful to Prof. N. Nakkeeran, Additional Professor and Prof. Dileep Andhare, Adjunct Professor of Indian Institute of Public Health, Gandhinagar, for his valuable guidance and time to supervise this project. Our sincere thanks to Dr. N. D. Shashikiran- Dean of People's College of Dental Sciences and Research Centre, Bhopal and Dr. M.C Prashant- Dean of RKDF College of Dental Sciences and Research Centre, Bhopal for granting permission to conduct this research activity at their centres. Among others we would like to extend a special thanks to Dr. Ajay Bhambal, HOD-Public Health Dentistry, Dr. Mrinal Bundela and Dr. Megha Saloki-Interns-Public Health Dentistry at People's Dental College Bhopal and Dr. Anshuj Thetay, Reader- Department of Orthodontics at RKDF Dental College, Bhopal for their kind support. Sauter S, Hales T, Bernard B, Fine L, Petersen M, Putz-Anderson V,et al. Summary of two NIOSH field studies of musculoskeletal disorders and VDT work among telecommunications and newspaper workers. In: Luczak H, Cakir A, Cakir G, editors. Ergonomics Foundational Principles, Application and Technologies. Berlin;Germany: Elsevier Science Publishers, B.V; 1992-1993. p. 229-34. McCauley Bush P. Work related musculoskeletal disorders assessment and prevention. Ergonomics: Foundational principles. In: Nunes IL, editor. Applications and Technologies, an Ergonomics Textbook. Europe: InTech; 2012. p. 1. Nunes IL, McCauley Bush P. Work-related musculoskeletal disorders assessment and prevention, ergonomics – A systems approach. In: Nunes IL, editor. “Ergonomics - A Systems Approach” Croatoa, Europian Union: InTech; 2012. Available from:http://www.intechopen.com/books/ergonomics-a-systems-approach/work-related-musculoskeletal-disorders-assessment-and-prevention [Last Accessed on 2015 Sep 15]. Okunribido O, Wynn T. Aging and Work-related musculoskeletal disorders: A review of recent literatures. In: Nunes IL, editor. Health and Safety Laboratory for the Health and Safety Executive 2010, HSE Europe. Available from: http://www.hse.gov.uk/research/rrpdf/rr799.pdf [Last accessed on 2015 Jun 22]. European Agency for Safety and Health at Work: Zinta Podniece. Work-related musculoskeletal disorders: Prevention report. European Agency for Safety and Health at Work; 2011. Available from: https://osha.europa.eu/en/tools-and-publications/publications/reports/en_TE8107132ENC.pdf. [Last accessed on 2015 Jul 17]. European Agency for Safety and Health at Work: Zinta Podniece. Musculoskeletal Disorders: General Questions. European Agency for Safety and Health at Work; 2011. Available from: http:// www.osha.europa.eu/en/faq/frequently-asked-questions. [Last Accessed on 2015 Jul 17]. Health & Safety Executive (HSE). Upper Limb Disorders in the Workplace 2002. Available from: http://www.hse.gov.uk/pubns/priced/hsg60.pdf. [Last Accessed on 2016 Jan 20]. Hollmann S, Heuer H, Schmidt K. Control at work: A generalized resource factor for the prevention of musculoskeletal symptoms? Work Stress 2001;15 Suppl 1:20-39.
WHO Expert Committee on Identification and Control of Work-Related Diseases. Technical Report Series No. 714. Geneva: World Health Organization; 1985. Indian Health Service: Ergonomics Recommendations for Dental Programs. Available from: http://www.dentalclinicmanual.com/docs/Ergonomic_considerations.pdf. [Last accessed on 2015 Sep 23]. Kahri P. Ergonomics and teamwork in dental treatment. Planmeca Oy; 2005. p. 1-2. Nutalapati R, Gaddipati R, Chitta H, Pinninti M, Boyapati R. Ergonomics in dentistry and the prevention of musculoskeletal disorders in dentists. Internet J Occup Health 2009;1:1-9. David G, Woods V, Li G, Buckle P. The development of the quick exposure check (QEC) for assessing exposure to risk factors for work-related musculoskeletal disorders. Appl Ergon 2008;39:57-69. Hignett S, McAtamney L. Rapid entire body assessment (REBA). Appl Ergon 2000;31:201-5.
de Barros EN, Alexandre NM. Cross-cultural adaptation of the Nordic musculoskeletal questionnaire. Int Nurs Rev 2003;50:101-8. R Core Team R. A Language and Environment for Statistical Computing. R Foundation for Statistical Computing. Vienna, Austria; 2013. Available from: "http://www. Rproject.org/>. [Last accessed on 2011 Sep 10]. Gupta D, Mathur A, Patil GI, Tippanawar HK, Jain A, Jaggi N, et al. Prevalence of musculoskeletal disorder and alternative medicine therapies among dentists of North India: A descriptive study. Pharmacognosy Res 2014;7:350-4. Yasobant S, Rajkumar P. Health of the healthcare professionals: A risk assessment study on work-related musculoskeletal disorders in a tertiary hospital, Chennai, India. Int J Med Public Health 2015;5:189-95. Rehman K, Ayas H, Urooj W, Shah R. Work related musculoskeletal disorders among dental practitioners in Khyber Pakhtunkhwa. Pak Oral Dent J 2013;33:531-4. Karwouski W, Marras WS. The Occupational Ergonomics Handbook. Boca Raton, FL: CRC Press; 1999. p. 69-170. Shaik AR, Rao SB, Husain A, D'sa J. Work-related musculoskeletal disorders among dental surgeons: A pilot study. Contemp Clin Dent 2011;2:308-12. Anand JS, Chaly PE. Musculoskeletal disorders among dentists: A review. IJSS Case Rep Rev 2015;2:28-30.